We took a quick trip to one of my favorite fishing spots along north beach road in Englewood! The west winds haven’t been favorable to the natural beaches in this area, causing most of them to still be under water. Since it was calm and such a beautiful day we decided to wade out and try to catch some fish we saw jumping around over the reef! We tied on every lure in the box with no luck! Whenever this happens its time to break out the net! Some days they only want live bait. We saw a few green backs swimming along the shoreline. Still smaller than usual but Andrew was skilled enough to grab a few in the net! The best tip about live bait on the beach has come from Captain Cayle’s wife Barb. She told me to put a frozen water bottle along with my bubbler in my bait bucket during really hot months. It helps to keep the bait active and alive! We quickly tied on some hooks for live bait. I like a simple loop knot for fishing along the beach, it helps the fish swim naturally. It wasn’t long until we started catching some smaller jacks & spanish mackerel! These are fun to catch on light tackle and make great bait for larger fish in the area. We were only staying about an hour so all the fish went back today to swim another day! Today I was testing out my new purple Fishin Franks pole paired with my Penn Conflict! As we were relaxing in the surf my son caught his first sea bass & I caught my very first gag grouper! Just a baby but its a wonderful sign that the reef in this area is healthy and coming alive this spring! Have a wonderful weekend fishermen! I really want to see the Triple tail before I cast, So let that one slide until tomorrow or Wednesday for Today the Tarpon and Cobia have been hiding out along bay shore and PC beach, those sneaky little buggers, we have all been looking south in the holes for them and they have been right here under our noses. So a slow idle from the bridge to PC beach should produce some nice fish to play with. Troll a bait buster, and a 16axsich bomber. We know you are there now Fish, You can not hide any more. Tomorrow the wind will be light out of the east a great time to fish the out side of the bar, idle up to the bar, until your motor touches bottom, shut off the motor, cast your line out towards the shallows, let the wind move you out to about 8 feet of water, catch fish repeat. Shark season is in full swing here in south west Florida. They are following the tarpon and looking for a quick tasty meal! The family and myself headed out for a night of shark fishing from shore. I decided we needed to try a new area since boca pass has been SO crowded with fishermen & boats making it a bit hard to land a fish. Shark guys I can’t stress enough that you must start cleaning up after yourselves!!!! Last time I was in the pass I gathered up a cooler full of garbage from just the spot I was sitting in. Bonita tails all over and at least 4 leader sections and glow sticks laying all over the sand. We also spoke with a park ranger who was very upset over some late night gate vandalism. They are working on installing a security camera due to the increased vandalism at this location. Land based shark fishing is under intense scrutiny already. We don’t need to add garbage piles and vandalism to the list of complaints! We set out on a side beach of boca grande. It was a beautiful and quiet evening and I was really hoping for a bite! A group of people were having a BBQ, playing fetch with their dogs and we were all just having a blast! About 25 mins after the sunset a hungry sharky picked up my bait! I was using one of our avet 80w with 100lb mono. She put up a good fight in the wavy conditions. After about 20 mins I landed a beautiful Lemon Shark! 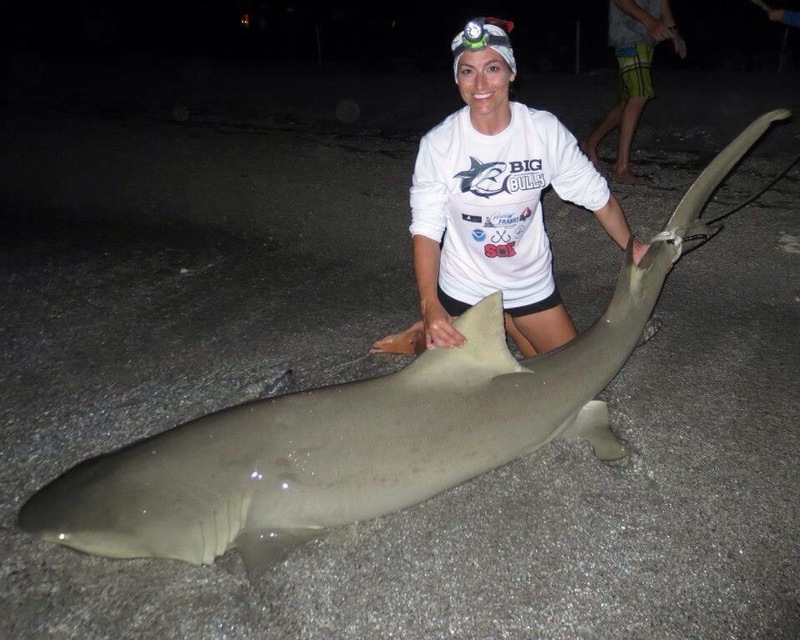 Lemon sharks are easily identifiable by their second dorsal almost as large as their first. A lot of people mistake them for bullsharks (which I’ve done myself in a rush) and even nurse sharks! The second dorsal is key to identifying this shark! These are the only shark species that can bite their own tails! Watch your fingers and toes and handle with care! 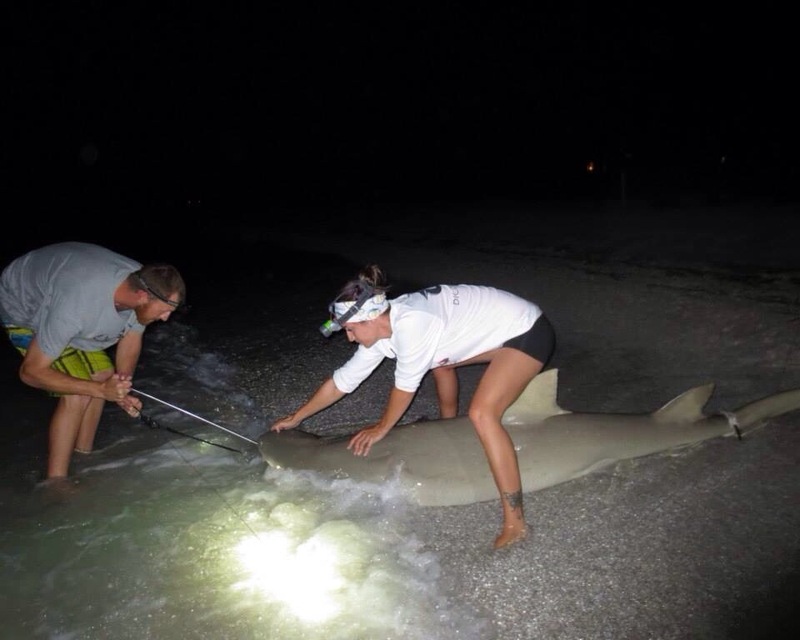 Lemon sharks are protected in Florida so we worked hard to keep her in the water while we measured, tagged and snapped a few quick pics! She measured 8 foot even and was a pregnant female, the surf conditions made for an easy release. As soon as we took the tail rope off she wiggled away and released herself! Can’t argue with that! 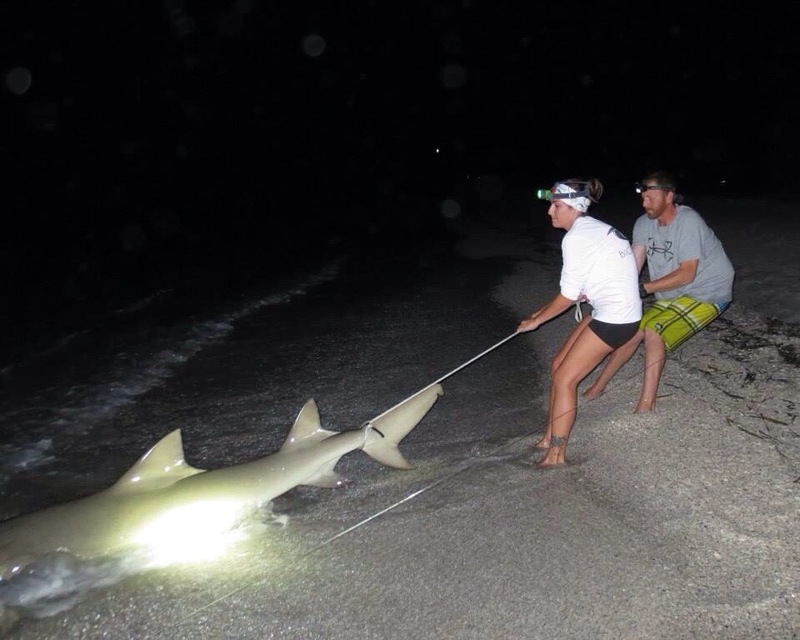 Later that evening we assisted some guys down the beach land TWO 8 foot plus bullsharks back to back! Their camera wasn’t functioning so thankfully I was able to tag one of their fish and get them a few pics to remember their awesome catches! 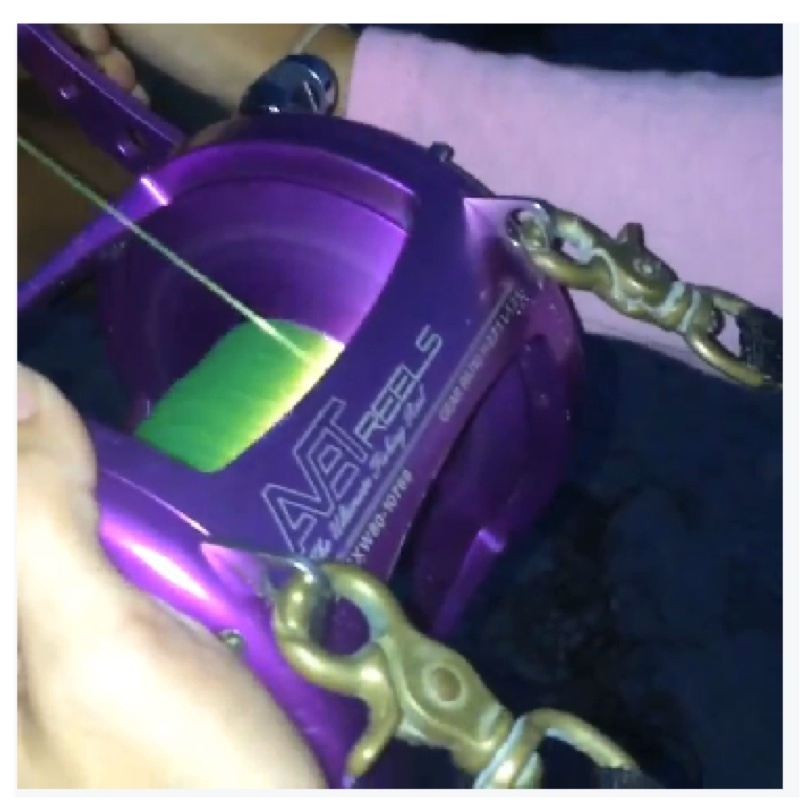 They even let my son have a turn on the reel which made his night! Thanks for sharing Scott, you made Aiden’s night! I love meeting kind & positive shark fishermen. If your headed out this weekend please remember to respect your fish and those fishing around you. You can do this by cleaning up your mess and any other mess you find along the beach! There’s so much plastic in our ocean already! If we all work together to clean it up the beaches will be even more enjoyable! Good luck my fellow fishermen! Have a fun and safe holiday weekend!! Hill tides are happening, which brings on the spawn, Tarpon are heading out into the deeper waters of the gulf, getting the process of making the next gen of Tarpon. Carbs are doing the same thing, which makes them the best bet for Tarpon right now. Thousands of crabs swim out to the gulf using the outgoing tide to help carry them out, Smart little guys, it is way easier than swimming against the currant. One other thing if you fish south in the Harbor think about getting a towing membership, there seem to be a rash of boats breaking down, and in this wind it is hard for your friend with our smaller boats to come get you. It cost more in fuel than the membership would cost you. just think about it. 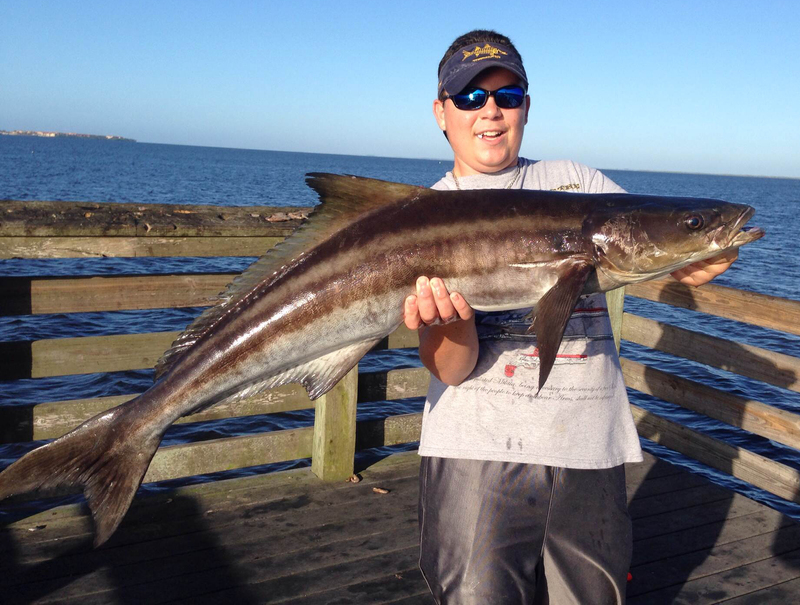 Austin Phelps shows off a stud cobia caught on a live whiting in upper Charlotte Harbor. The fish was nearly 44 inches long and weighed over 25 pounds. With so many people fishing the U.S. 41 bridges for cobia this season, some anglers have shifted their focus to the piers in upper Charlotte Harbor instead. Last week, that tactic paid off for me with a 35-inch, 20-pound cobe. This morning it paid off even bigger for my buddy Austin, who caught one of the biggest cobia from a pier I’ve ever seen in the area. I met Austin on the pier with the nearly full moon still hanging low over the Harbor, and we immediately went about catching bait since the whiting bite generally shuts down as the sun comes up. We managed to whack several whiting, and put baits out just before the sun started peaking up over the horizon behind us. It didn’t take long for the action to heat up. As I wandered down the pier looking for bait to castnet, Austin had the first run on his Penn Spinfisher 6500. 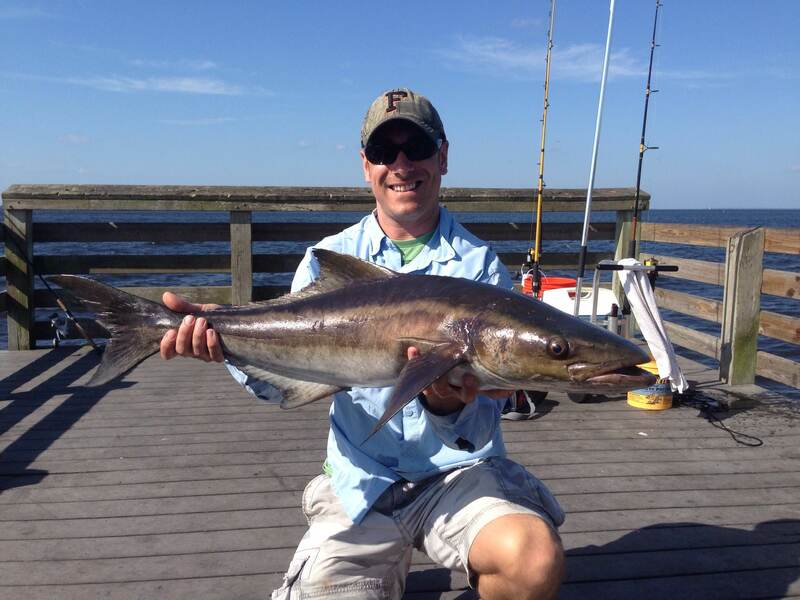 The fish took the bait and ran straight toward the pier, exactly what the cobia I caught last week did. Unfortunately, Austin wasn’t able to get a good hook-set. Not too long after that he got a little more excitement as he hooked a gar. The fish had taken out a good amount of line and we were hoping for that cobia, but would have to wait a little longer. But Austin had already seen the fish on the surface while I was getting the net ready, and he assured me it was a cobia. I got my first look at it a few minutes later as he battled it in close to the pier, which is when I realized how massive it was. It took us several attempts to get the behemoth in the net, as the sheer size of this cobia hindered our landing efforts. But the drag on the Penn Spinfisher gave Austin good control of the fish, and he was able to keep it clear of the pilings with his 7’6” Star Rod – rated 15-30 pounds – until I coaxed it into the net. We both had to grab the net and hoist it over the railing with a team effort. I was happy to help pay it forward, as last week my buddy Mike had done the same for me with my cobia. Austin and I high-fived and started celebrating as soon as the fish hit the deck. It was a stud for sure. While it wasn’t quite the 50-inch fish I had anticipated, it wasn’t too far off. The full length of this cobe was nearly 44 inches, and even after we gutted the fish it still weighed 25 pounds. Tell me that’s not a trophy pier fish. As I was taking pictures of Austin’s catch, my Quantum Boca PTS 60 Bait Teaser started going off. The bull shark I caught and released this morning. This time it was my turn to miss a hook-up, and I reeled back in the head of a whiting. That was a big clue the fish that was after it wasn’t a cobia. I re-baited my hook with the last live whiting we had and cast out. It had barely hit the water when my reel started screaming again. 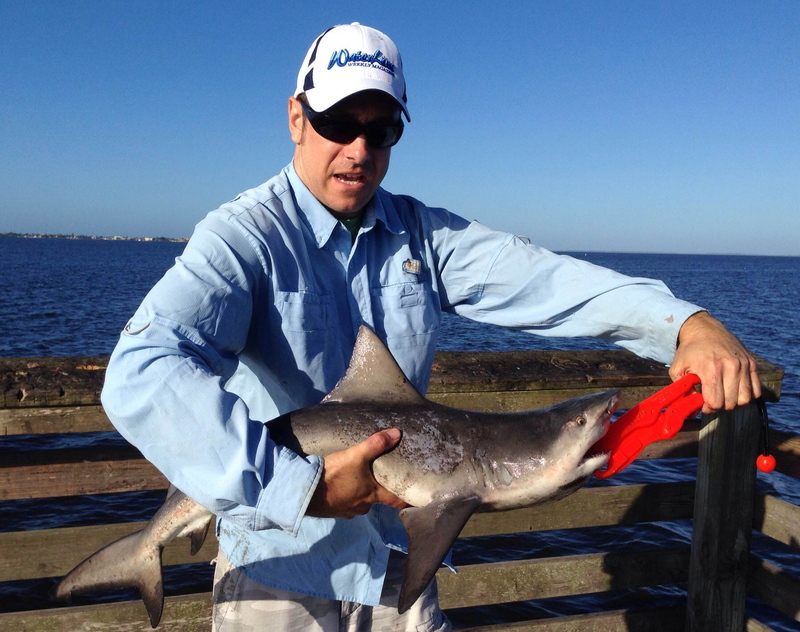 I followed Austin’s cobia up with a nice little bull shark that we quickly released. All in a morning’s work. Upon examination of my cobia last week, I found a stomach full of catfish bones and fins, and even a hardhead skull. While there were a few bones in the stomach of Austin’s cobia, there were three other things that really caught our attention. Two of them were hooks – one circle, one j-hook – with steel leaders attached. This was a sure sign the fish had previously terrorized at least two unlucky anglers who weren’t able to land it. The other item was a stingray barb that was sticking in the side of the fish’s inner abdominal cavity. You never know what you’ll find inside a cobia. Until next time, hook ’em up and fight ’em hard. Fish on, fellow anglers. May 1st was going to be my night! I set out after a certain kind of fish. Andrew finally landed his hammer after 4 years of trying and I really wanted to catch one myself. Knowing what they are eating and where they are located we set out with big things in mind. I anxiously awaited sunset. This is when we’ve been getting the most bites. Just as the sun vanished into the horizon my 80w went screaming towards cayo costa and had no signs of stopping! I quickly strapped myself in to only watch my line vanish before my eyes. I gave more and more drag. Still this fish was not stopping. I yelled down the beach to some fellow anglers for some help to reel up our other rod in-case we had to make a run down the beach. Now im getting concerned as I only see about 200-300 yard left on the spool and can hardly stand up. I had my trauma sheers in my hand in case I needed to cut the line. Austin Wholean and friends came to my relief and we put a STOP to this fish with 100 yards or less on the spool. Now we had to use some serious muscle to gain back the line. In the previous weeks we’ve lost a fish to the many tarpon boats across boca grande pass. We knew we had to keep this fish from running out of the pass. I soon knew that I couldn’t do this alone, as I almost fell face first into the sand. The power behind this fish on locked drag was something I’ve never felt and I have been spooled twice previously. All 5+ guys worked on hand- lining so it was easier for me to gain line back. It WORKED! I was able to gain back about 600 of my 750 yards before disaster struck. Just as I was getting excited about possibly landing this monster she ran again and this time right towards the tarpon boats. I made the decision to stop her. All hands on deck. I held the spool and the guys dug their feet in the sand and held on the best the could. Unfortunately the line snapped near shore and I never saw her. The breaking strength of 100lb suffex mono is holding the spool, while five guys play tug of war. WAY over 100 lbs. I’m a firm believer that if its meant to be your fish it will be. I am grateful to be privileged enough to feel this ocean beast’s power. We play tug of war with these elder’s of the sea and especially the ones we loose keep us coming back for more! Pictured above is the line of helpers! Andrew at the front & Austin and I at the reel! My first cobia of the season, a 35-incher caught on a live whiting. While cobia are big brutes that are notoriously hard fighters, they also have a sneaky side. Sure, these fish can peel drag off at an alarming rate and have a tendency to slam a bait and double over a rod when hooked up, but if you’ve ever had a cobia creep up on you, you know what I’m talking about. This morning at Bayshore I got to experience that first-hand. After soaking live whiting for the better part of four hours all I had to show for it was a gar, and my buddy Mike and I were getting impatient. We started paying less attention to our lines and were more focused on telling fish stories. The wind had picked up to a pretty good clip by about 9:45 a.m., making it tough to notice any subtle changes of slack in your line, sometimes the only clue that a fish has picked up your bait. But the fishing had been so slow that I wasn’t too worried about anything major happening. Until, that is, something major did happen. That’s one of the great parts about fishing: you can fish all day and not catch squat, but in minutes that can change completely. One minute you’re standing on the pier doing more talking than fishing, the next minute everything sets in motion and you’re hooked up to a big fish. I happened to notice my line going slack at a pretty quick pace, a good sign a fish had taken the bait and was heading toward the pier with it. After picking up my rod and cranking the reel a few times it was obvious there was a fish running straight at me. I reeled in a little more slack and set the hook. Time for the moment of truth … ZZZZZZZZZZZZZZZZ!!! I was greeted by the sound of sizzling drag as the fish did a 180 and bolted away from the pier, smacking the surface after taking around 30 yards of line out and making quite a ruckus. As I fought the fish I still wasn’t quite sure what I had; the beginning of the battle was intense, but as the fish turned and headed toward the bridge it seemed to settle down and I thought it might be a big ray. Then the fish did something that completely surprised me. It made a 90-degree, left-hand turn and started running toward shore, parallel to the pier. I quickly followed, with Mike behind me carrying the net. About halfway down the pier I got my first glimpse of the fish, and it was most definitely not a ray. It was a nice cobia. “It’s a cobia, it’s a big cobia!” I yelled to Mike. Worried that the fish wasn’t tired enough to land, I let it do what it wanted until it finally started getting too close to the pier for comfort. “Alright, it’s ready. 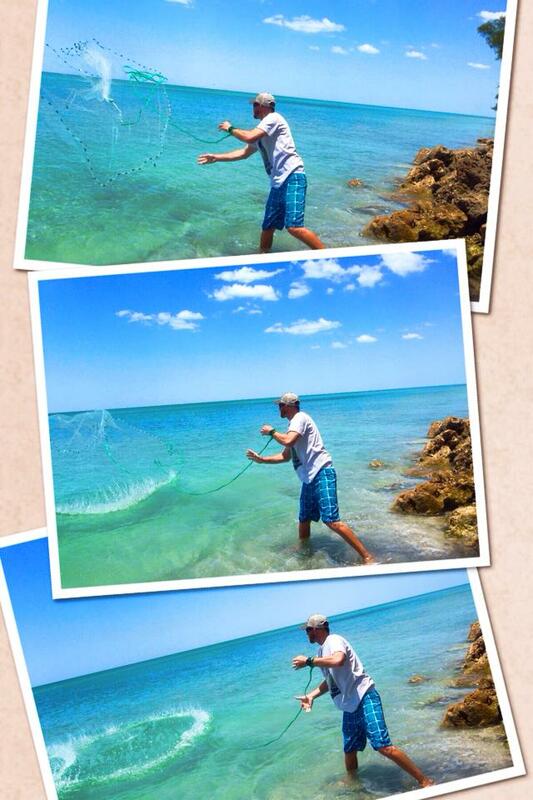 Drop the net!” I said. But the cobia still had some gas in its tank. The next few seconds were a bit dicey as the fish tried to dart under the pier, then came close to getting wrapped around a piling. Situations like that will make your heart rate double, and the fear of losing the fish takes hold. But I was able to muscle it into the net and Mike hoisted it up and over the railing. I let out a huge sigh of relief and smiled. I had whacked my first cobia of the season. The fish measured 35 inches, but was heavy, probably weighing over 20 pounds. 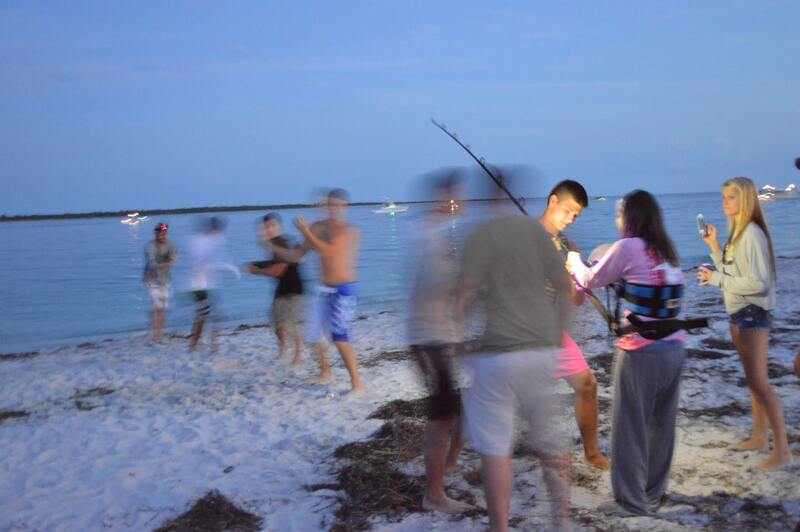 It had been enticed by a live whiting, easily the best cobia bait for Charlotte Harbor. After missing two cobia earlier in the season, this was a sweet catch. While I’ve had success using circle hooks for cobia in the past, those two fish I missed were both on offset circle hooks. So I had lost confidence in them and started using j-hooks – No. 7/0 Gamakatsus – instead. On this fish I got a solid hook-set, right in the meaty part of the fish’s mouth, and there would be no losing this one.